THERE have been more than 6,000 paramilitary ‘punishment’ attacks on men, women and children across Northern Ireland since the start of the Troubles. Lives were lost and limbs destroyed in assaults and shootings carried out by paramilitary organisations on both sides. Despite the brutal punishments, there was widespread support within some communities for the paramilitaries’ own form of justice. Attacks have continued into the present day with almost 500 such incidents reported in the last six years alone. For ‘Above The Law’, a Below The Radar TV production in association with RTÉ’s Investigation Unit, The Detail obtained a breakdown of the shootings and assaults which have taken place since the beginning of 1990. We also examined historical data going back to 1973. 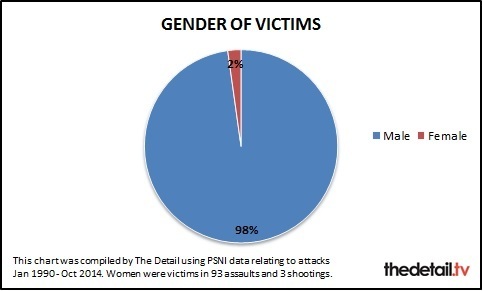 The information we received from the Police Service of Northern Ireland (PSNI) in response to a Freedom of Information request gives a breakdown of what they officially term ‘paramilitary-style attacks’ from 1990 by police area, the gender and perceived religion of the victim and whether the attackers were loyalist or republican. The statistics we received include attacks which took place up until the end of October 2014. The map at the top of this article provides information on the attacks which were reported as taking place in each police area of Northern Ireland. And click here to see a more detailed timeline of attacks. Victims and their families have spoken out in the documentary about the impact of the attacks including living with serious injury and assaults which led to murder and suicide. 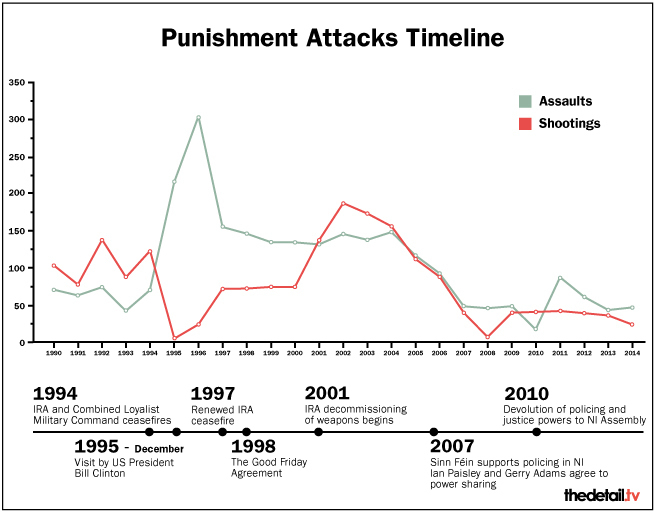 4,336 punishment-style attacks were reported to the police in Northern Ireland from the beginning of 1990 to the end of October 2014. There were 2,476 assaults and 1,860 shootings. Almost 58% of the victims were Protestant, 42% Catholic and less than 1% categorised as ‘other’. ‘Other’ indicates either another religion or religion was unrecorded. 1,443 of the assaults and 1,080 shootings were carried out by loyalists. 1,033 assaults and 780 shootings were attributed to republicans. 2% of the attacks involved female victims. They were subjected to 93 assaults and three shootings. Half of all attacks took place in Belfast. The highest number of assaults were reported in West Belfast – 357. The highest number of shootings took place in North Belfast – 481 incidents. It became common to describe attacks as ‘so-called punishment attacks’ in an attempt to remove the suggestion that the victim was guilty of a crime worthy of an assault. We also asked for information on convictions for paramilitary-style attacks. The PSNI said figures were only available from January 1 2009. From this date until the end of October 2014 there were 491 paramilitary-style attacks and in 13 of these cases charges were brought against at least one person. Only one person has been convicted to date (correct as of December 18th 2014). All of the 2014 data is provisional. The PSNI response to our request stated: “Typically a paramilitary style attack is carried out on an individual or individuals by one or more persons usually from their own community. The PSNI began to record paramilitary-style shootings in 1973 and assaults in 1982. Of all the 6,106 paramilitary attacks recorded by the PSNI since 1973 – 3,113 were attributed to loyalists perpetrators and 2,993 to republicans. 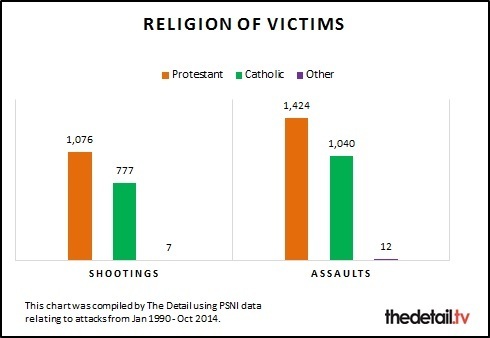 Religion is perceived by the PSNI using factors such as the victim’s name and where the attack took place. The PSNI said that attribution of loyalist or republican is as perceived based on the information available and does not necessarily indicate the involvement of a paramilitary organisation. Eleanor King’s brother Andrew Kearney was shot in 1998 for the alleged ‘crime’ of punching an IRA leader. The 33-year-old bled to death after his attackers ripped out the telephone from his New Lodge flat and jammed the lift door where he lay. Interviewed for the RTÉ documentary, Eleanor said: “I have nightmares all the time. I just see them busting in the flat and how he must have felt knowing what was going to happen. I know he would have been terrified. She appealed to Sinn Féin leader Gerry Adams to use his influence within republicanism now to help her family. “He has the power to go to the IRA and get them to admit Andrew’s murder." Thomas Marley’s son Gerard was attacked by the IRA when he was just 15. His alleged ‘crimes’ were car theft and taunting an IRA man. After a second beating, he took his own life. Thomas said: “The first time he was beat was for stealing cars. They broke his leg. That made him angrier and more defiant. The second beating with an iron bar resulted in Gerard having to use a wheelchair. Gerard died from suicide in July 1997. 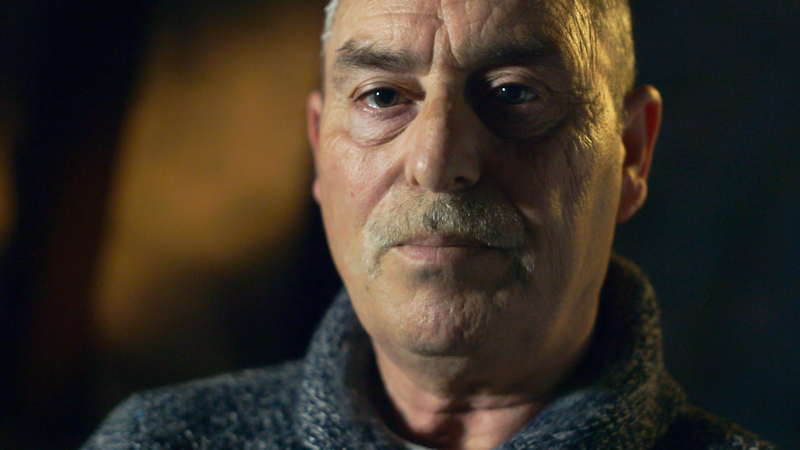 The documentary also features Andrew Peden who was shot in both legs by the UVF in 1998 – just three weeks after the signing of the Good Friday Agreement. Both of his legs were amputated above the knee. He said: “They were just shouting… ‘We’re going to do this, we’re going to do this, you’re not going to see your kids again. You’re getting shot dead’. He said that all attacks are fully investigated but challenges include injured parties being unable or unwilling to provide information to help to identity offenders, witnesses may be unwilling to cooperate possibly due to fear of reprisal and limited forensic opportunities. He continued: “We continue our efforts to secure and build trust and support for the police within our most vulnerable communities across Northern Ireland. However, as much as this is a criminal justice problem it is also a wider societal and cultural problem, sometimes evidenced by the fact that these attacks are carried out ‘by appointment’. Above The Law, a Below the Radar TV production in association with the RTÉ Investigation Unit, will be broadcast tomorrow night (Monday 23 March, 2015) on RTÉ ONE at 9.35pm.